I was challenged by Marshalls to shop the sale rack and put together a killer outfit. While this may be a challenge for some, I am a gal who always shops the sale rack...always! Can I get an amen? So I challenged myself to put together a few outfits within a limited budget, instead of just one. I headed over to my favorite Marshalls- local ladies, I'm talking about the one in Danville, and hit the mother-load. Seriously! There were so many designer items for such affordable prices- my cart was full in a matter of minutes. I found these amazing distressed jeans by Joes for only $39 compare at $130 and this cute fringed bag for $16 compare at $30. I mean, what's not to love about that?! But where I really scored was this top. I'm obsessed with anything off-the-shoulder, especially when it has flowy, flirty sleeves and a beautiful print, so when I saw the price I was shocked. PEOPLE. All caps because it's THAT big of a deal...$1. Not kidding, it was a dollar. I was thinking there had to be a flaw or something. Nope, nothing. Just a crazy deal. You can't even get a pack of gum at Safeway for that price!! Needless to say, I scored big time, especially since the original price was $36. I have a few other clearance rack outfits that my fellow budget fashionistas will love- stay tuned. Have you scored any recent deals? I would love to hear about them! 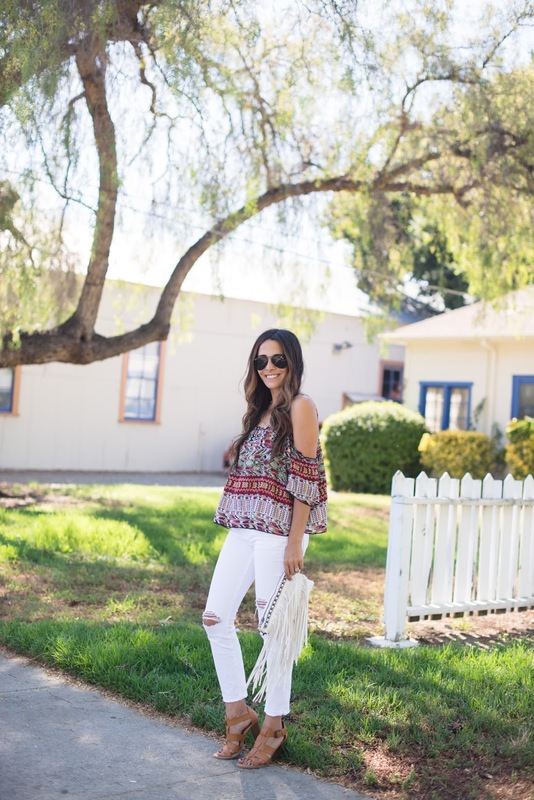 love everything about this look, especially the off shoulder blouse and the fringe bag! perfect! Great look! The top and jeans are awesome! Cute bag n gorgeous outfit!! Who make the top? I love it all!